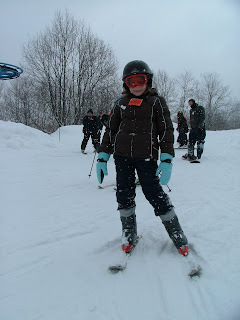 I think I mentioned we went skiing for our first time (mine and Billie's)a few weeks ago. We went with Brian, Cathy, Susan and her kids (Matt's cousin from Michigan) and Amy (Matt's cousin from Arizona!). 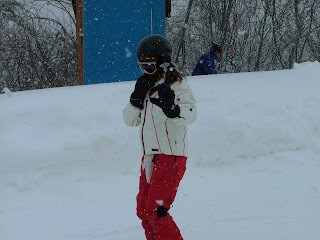 It was Amy, Billie and my first time to ski ever. I was so NERVOUS! I just knew I would break a leg or get some horrible head injury. In fact, as we were driving up the driveway to the slopes I got so sick to my stomach, and I was thinking to myself "I have avoided skiing like the plague for 37 years, what am I doing here?! I am going to end up killing myself out here, this is nuts!" OK, so I am a drama queen! Now you all know where Billie gets it. But I kept my mouth shut because Matt loves it so much and I know he wanted me and Billie both to at least try it. 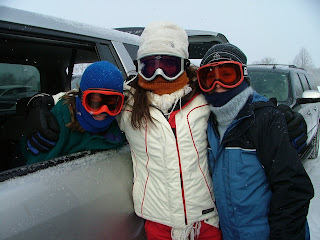 The last picture here is of Billie, Amy and myself as we were getting our gear on--before we went skiing. 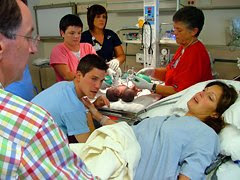 We all three did great! It was so much fun! We all fell a few times at first, but after about an hour we were all able to make our way down the mountain. It was great. We took a lunch break at around 3 or 4 and then went right back out. I did fall later that evening off the chair lift, like the big clumsy person I am, and the chair lift hit me in the back of the head! It hurt so bad, I immediately got a splitting headache. But I had a helmet on, as did Billie-who I had pushed down by accident when I fell. I am so graceful. It is so funny now! But I was so embarrassed and my head hurt so bad. I admit, I threw a little fit. Luckily my family loves me enough to put up with me! Well, we did a few more runs and about 7 pm I couldn't stand the helmet on my aching head anymore so I gave up and went in, and Brian, Cathie and Amy came in with me. Billie and Matt stayed out on the slopes and we had to drag her off at 9:30 that night! She had been skiing for almost 11 hours straight at that point, and we were afraid she was so tired she would end up hurting herself. We only got her to agree to come in by promising we could go again the next day. 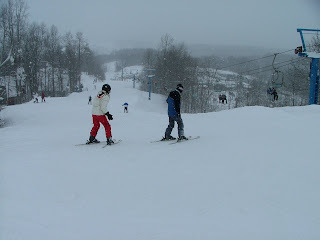 We were at Winter Place in West Virginia, and we had hotel reservations for the night. I forgot to mention that it snowed all day--there was several inches of snow on the car when we got back to it that night. We all went out to dinner and then went straight to bed, we were all exhausted. The next morning we were all sore and tired and none of us really wanted to ski again, and my head was still throbbing so bad. Billie slept really late, she actually fell sleep in my lap at the restaurant. When she woke up the first thing she said was "What is wrong with my body?" Bless her heart, she was sore! 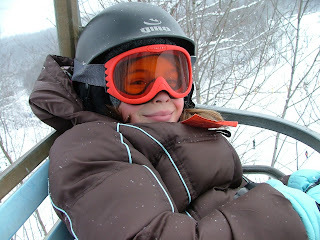 She made the decision herself not to go skiing that day because she was so sore and tired. So since there was a pool at the hotel, we let all the kids ski for a few hours while the grownups watched and visited together. We drove home later that day and got home late in the evening. It was great, though. We promised Billie we would take her again soon-for sure one more time this season. The first picture here is a picture I took the other day of Billie playing in the snow. I thought it turned out so cute I would share it with you. 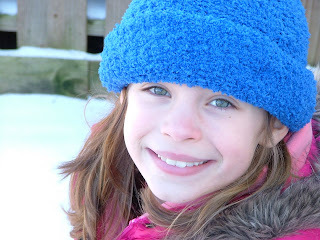 The blue hat made her eyes look so blue! They are usually more green looking, but not when she wears blue!